hi loves! it’s certainly been a while since i’ve last posted. you can thank sl for my long time away for giving me so much technical trouble… but i was finally able to sign back it and do a quick look. 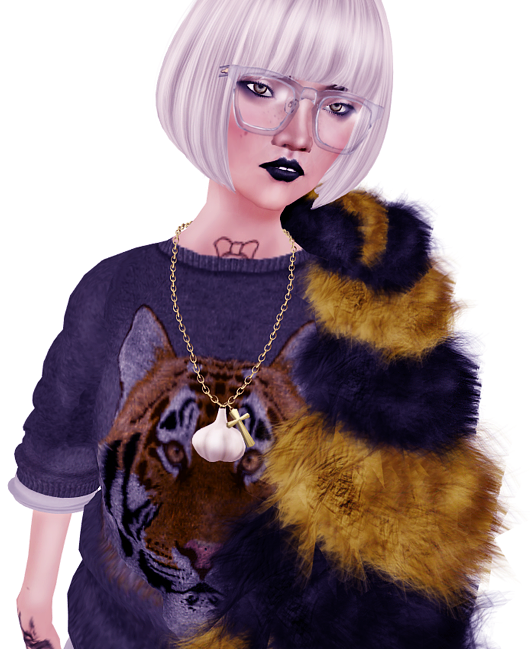 i logged in after a while spent away only to come back to some gorgeous new pieces by mon tissu. i was especially drawn to the sequin cardigans in the white color particularly. given it’s right around the holidays, i was just in the mood to wear some virtual sequins in a wintery white, seasonally appropriate shade. i paired it with some brightly colored celoe pants which i absolutely adore (been a little obsessed with hot pink lately, especially when i just recently got a pink blazer in real life that i can’t seem to get over). the hair is new from lelutka – i loved the messy bun on top… the fact that it wasn’t the typical high-on-top-of-your-head, tight bun we’re used to seeing lately. it’s loose, soft, with hairs cascading down from it oh so lightly. 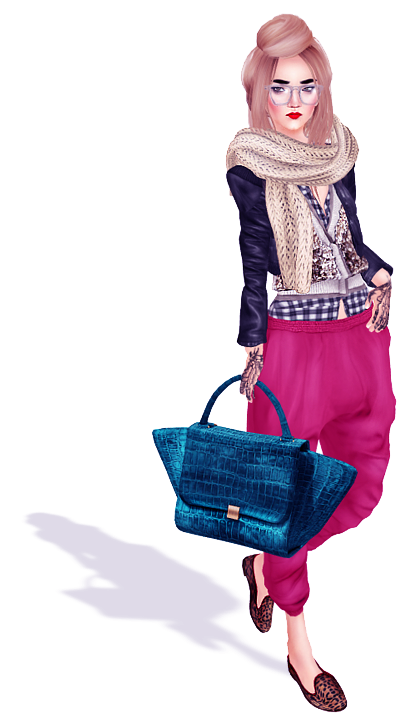 i couldn’t wait to log in and also carry lagyo’s bag.. and you know how i am with brightly colored accessories! overall, i wanted to create a look that was casual, street chic, yet read a little holiday with the sequin shine as we indulge in this time of year. missed you all and hope to be back soon again to style another look! so, i’m not quite sure if we’re going through an indian summer, but i’m starting to get a little irritated at how i’m still unable to wear some of my favorite fall pieces that i have been dying to wear lately. thankfully, in the pixel world, i can wear a fabulous colored fur stole that i’d possibly have to wait another 3 months to wear irl. colored fur is absolutely amazing and bloomingdales is standing all behind it – i adore it. i was ecstatic when i saw some at bliss couture in a variety of colored pairings… this navy and marigold color being one of my faves. 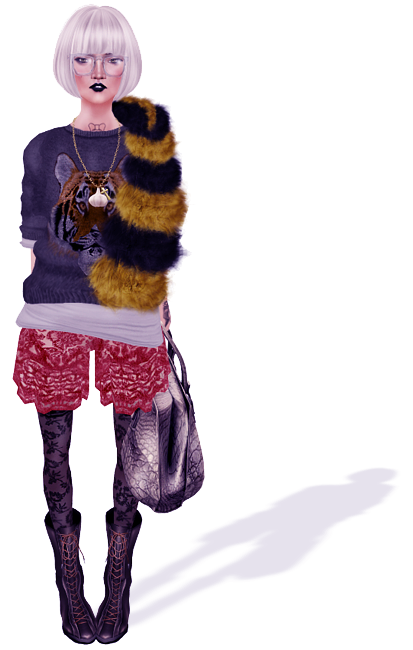 i love mixing casual with fancy – a comfy tiger sweater from milk motion with the bottom lace portion of a mimikri dress with a luxe crocodile bag by ison topped off with transparent glasses and some rugged vooner boots. it’s all about the mixing and matching and coming up with combinations that pique the interest. oh, and i really love this anna wintour-esque hair by elikatira. i instantly grabbed it in the essentials pack because i tend to have a.d.d. with my haircolor and can’t stick to one particular family of shades. fall, will you stop slacking and come already? back with another post! so i’m sort of ecstatic that the mademoiselle collection from lagyo is finally released. i was able to see some of the works in progress as they were being created, and had to hold my breath and try to contain my excitement… but they’re finally out! the headpiece i’m wearing is one of the many extravagant ones newly released by lagyo – and we all know how amazing some of gyo’s headpieces can be. i liked how the blue shade of this one went with the rest of the outfit. the top is absolutely adorable and perfect for summer to come – it’s new from love.me from the darling callia pearl. as for the skirt, simple and chic from whippet & buck for 50L friday. i’ve been seeing more of these skirts around irl in both solids and prints – so easy for the summer! and of course i had to top it all off with a nice pair of classic shades, recently released by alphavillain. if you don’t already have them, do yourself a favor and go grab them. that’s about it for now. ’till next time, loves! it’s been a few days since my last post and so i apologize for the lack of swiftness on the posting front – but life has been busy! but not to worry. i wasn’t going to neglect some great items that have been out recently – one of them being the new lagyo items. floral, feminine and spring focused, these items have been wonderful to style with. the brilliant minded gyorgyna (love you much! <3) is out with some incredible pieces once again that’s definately worth looking at. i instantly fell in love with this headpiece as well as the amazing deer ring. i created the rest of the look with milk motion’s latest 50L friday top as well as some older items i’ve been so quietly housing in my inventory. after buying this older coco puff down jacket, i don’t think i’ve ever had a chance to wear it, so i’m glad i’m finally putting it to good use. 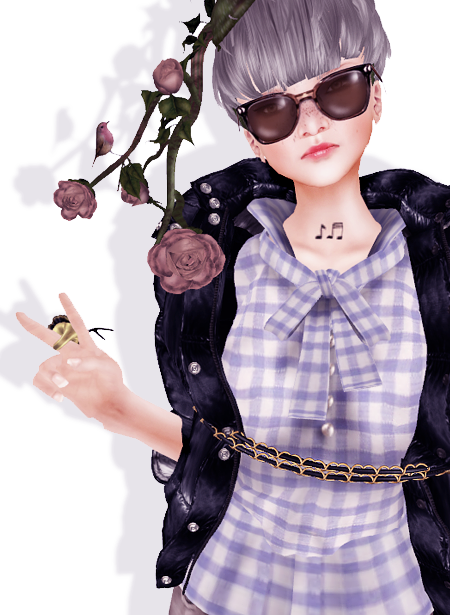 the look ended up being a bit boyish with a pretty, floral touch from the headpiece and a bit of cool from alphavillian’s season hunt shades and my oh so favorite oxfords. i’ll never get tired of them! when i first saw this split pea headpiece, i knew i wanted to create a look around it. its grandiose appeal is so attractive that it urges me to create a look using it. the hair is new from clawtooth (ty bubbles! <3) that i am just totally in love with – especially those awesome sideswept bangs across the forehead! as for the skin, i don’t think i gave old bones enough of a chance than i should have – and thank god i finally did because it has now become a favorite… especially with those great lipstick tattoos with the wet plum option featured below. the rest of the outfit is a mix of some old favorites and some new like emery’s new top and criore’s upcoming adorable sheer floral leggings!